Recently I was asked a question that most of us grapple with. 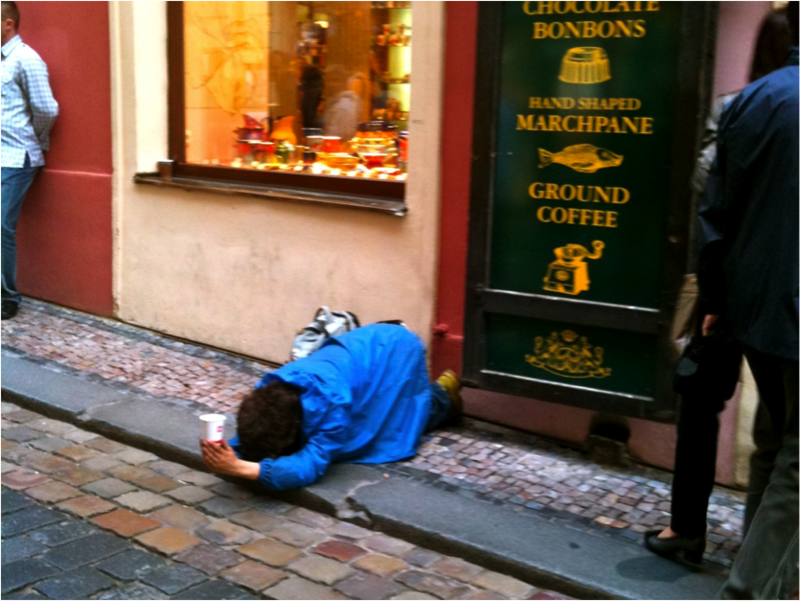 Does humility prevent self-confidence? 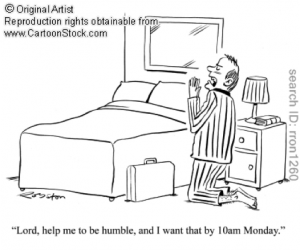 Or does self-confidence automatically prohibit humility? Is humility just an excuse to not be over-confident? Three young men hopped on a bus in Detroit in the 1930s and tried to pick a fight with a lone man sitting at the back of the vehicle. They insulted him. He didn’t respond. They turned up the heat of the insults. He said nothing. Eventually, the stranger stood up. He was bigger than they had estimated from his seated position — much bigger. He reached into his pocket, handed them his business card and walked off the bus and then on his way. As the bus drove on the young men gathered around the card to read the words: Joe Louis. Boxer. They had just tried to pick a fight with the man who would be Heavyweight Boxing Champion of the World from 1937 to 1949, the number one boxer of all time, according to the International Boxing Research Organization (second on the list is Muhammad Ali). Here is a man of immense power and skill, capable of defending his honour with a single, devastating blow. Yet, he chooses to forgo his status and hold his power for others — in this case, for some very fortunate young men . Just because he chose to be non-assertive in this particular situation does not by any means imply that he was not confident or that he had any doubt about his ability to tackle the three guys. We often confuse humility with timidity. Humility is, not clothing ourselves in an attitude of self-abasement or self-denigration. Humility is all about maintaining our pride about who we are, about our achievements, about our worth – but without arrogance. It’s about a quiet confidence without the need for a meretricious selling of our wares. It’s about being content to let others discover the layers of our talents without having to boast about them. It’s a lack of arrogance, not a lack of aggressiveness in the pursuit of achievement. An interesting dichotomy is that, often, the higher people rise, the more they have accomplished, the higher the humility index. Those who achieve the most brag the least, and the more secure they are in themselves, the more humble they are. “True merit, like a river, the deeper it is, the less noise it makes”. 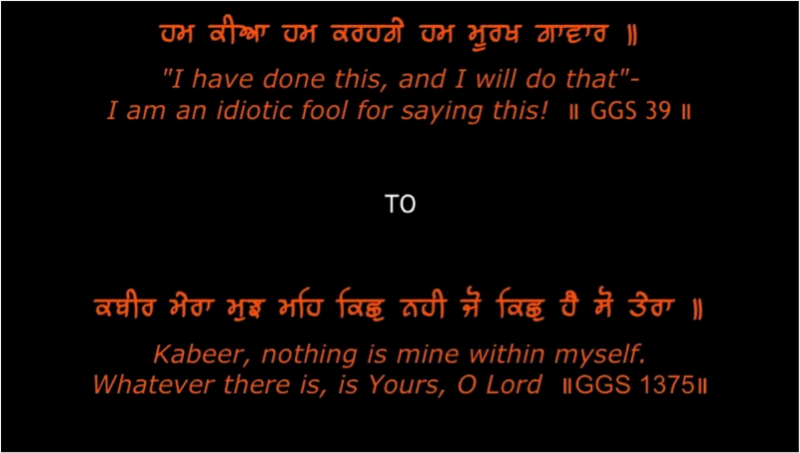 The Sikh Gurus set many examples of meekness and humility. “…Sri Guru Angad Dev Sahib Ji appointed Sri Guru Amar Das Sahib Ji as third Sri Guru Nanak Sahib in March 1552 at the age of 73. He established his headquarters at the newly built town of Goindwal Sahib, which Sri Guru Angad Dev Sahib Ji had established. Meanwhile, going against his father’s wishes, Datu one of Guru Angad’s sons proclaimed himself as Guru at Khadur following his father’s death. He was so jealous of Guru Amar Das that he, with a small group of his supporters, proceeded to Goindwal to confront the Guru. Upon seeing Guru Amar Das seated on a throne surrounded by his followers he said, “You were a mere menial servant of the house until yesterday; how dare you style yourself as the Master?”. At that point, Datu kicked the aged Guru Amar Das so hard that he fell to the floor. Taking the seat of the Master he then proclaimed himself Guru to the assembly of Sikhs. The Sangat must have been shocked as this not only flew against Guru Angad’s wishes, but against centuries of respect that the people of India and the Punjab had for their elders, to kick the revered Guru was indeed – shocking. Similarly Sri Chand, Guru Nanak Dev Ji’s son asked Guru Ramdas Ji in a humorous way why he had kept such a long and flowing beard. The Guru replied: “To wipe the dust off your holy feet.” Sri Chand was much impressed by the Guru’s humility. The direction is set, the goal is clear, the journey an ongoing one. 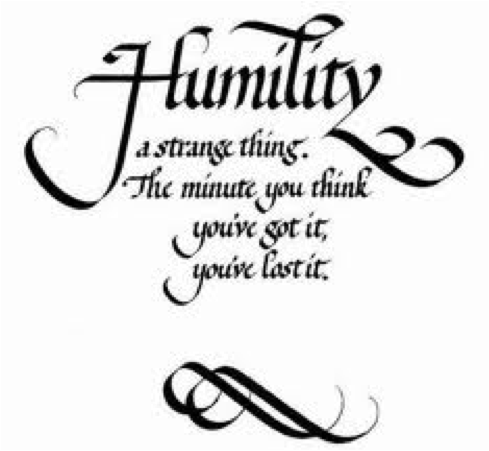 Humility is not something you say, but something you do and you don’t even realize you’re doing it. It’s not something that you work for, but it is who you are. Humility is slippery, beyond one’s grasp, it comes from the inside out. Thus, the moment you think you have it you have lost it! To be confident or not to be confident, that is the question. Do you really need to be more confident or should you try to be more humble? I believe the answer is both – you just have to know where to use it. It is a balance – it is not an ‘either’ ‘or’ situation, but both. A confidence that stems from the understanding that your guru loves you no matter what and values you even if you are full of faults. A confidence that sets you apart without you having to advertise it, a confidence that radiates from within. Where and how does one get that confidence? Humility is seeing divinity in everyone and everything. It’s seeing divinity in yourself too, so there is no point in putting yourself below others, but also not above others. 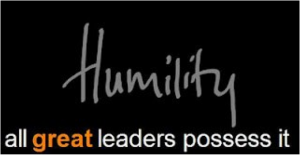 Humility is the ability to be humble while maintaining one’s integrity. You do not need to be boastful or tell people how wonderful you are or how much you know or what you can do. Although you may be quite knowledgeable or competent, it is for others to discover through your behaviour and your actions. It is your ability to sincerely apologize when you have erred and help others who are in need without expecting thanks or compensation. A viewpoint that leads you to humility is to see your primary role in this existence as that of a servant – as someone that creates joy for others. This perspective gives you a mindset of empathy, support, willingness, tolerance, patience, gratitude, forgiveness, and balance that transcends the ego’s need for superiority. Seva is a prime example of this. Our mental model of a humble person is often that of a person stooped over in a submissive pose. I do not believe this is a good model. You can be humble, yet be forthright and enthusiastic about life and your connection to it. Many things we do, say, or achieve appease our ego’s need for self-esteem or feelings of superiority. To achieve without arrogance requires a conscious decision on our part to do our best in some way while not allowing our ego to capitalize on the result. they achieve merit yet do not rest proud in it. We are all a work in progress with the potential of being God! What is required is great patience, persistence and faith. I see that some people are excited about their achievement and that they really want to share it with others. But they don’t do it because they are “supposed” to be humble. I don’t see any harm in sharing our goodness and happiness with others if we don’t mean that we are superior to others. We all can be great at the same time, and it can be a pleasure to share our greatness with others. I also see that some people do not at all talk about their achievements because they don’t feel like naturally. Others label them “humble”. And then since it looks great that they are not boasting of their achievements, others try to copy them and make it a standard to follow. And then they keep going to and fro between their instincts which want them to show off their achievements and outside standards of humility that they have set for themselves. 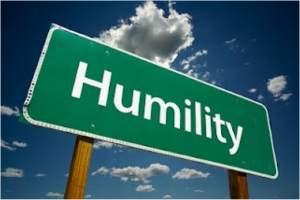 One of the best definition of humility I have found is: “Humility is the acceptance of the truth”. If we just look at the grandness of the sun and the universe and see how much we compare to it, wouldn’t humility naturally well up within us? If we look at the great people around us or in the world, look at the beauty of the flowers, the chirping of the birds, or even all the gifts we have received from the life, wouldn’t we naturally observe our own insignificance? Who are we in the grand scheme of things? Nothing much. Wouldn’t that bring humility? What would be there to boast of? This will be true humility. Because this behavior will be consistent with our paradigm, the way we look at the world. The reason we don’t find any success in becoming humble is that we are trying to change our behavior without changing our basic paradigms (Stephen Covey talks extensively about paradigms in his book “The Seven Habits of Highly Effective People”). If we believe our success depends on the actions of others, then it’ll be difficult for us to not sell ourselves. I believe selling ourselves is different from communicating our strengths and areas of expertise. However, if we believe in the law of karma i.e. we create our own reality, then we’ll not get threatened by the behavior of others and will continue to do what we feel like doing most naturally. I think it is becoming an article in itself! 😛 Let me stop. It’s a pleasure to read your articles, bhainji! There is one mistake I noted in the article. In the sentence “At that point, Datu kicked the aged Guru Angad so hard that he fell to the floor”, it should be Guru Amardas, not Guru Angad. Chiranjiv, thank you so very much for your great addition to this topic and also for pointing out the blooper. 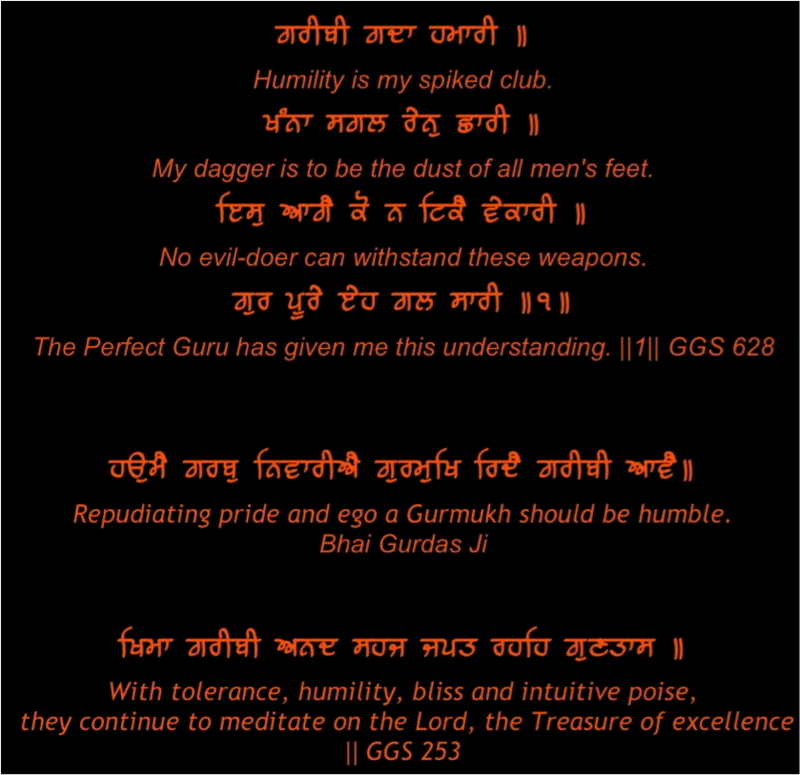 http://www.backtogurbani.org is a wonderful place for some super resources, ideas and guidance. Thank you!!!!! Beautiful article, sets many things straight. But in my young experience, I’ve seen that being humble and not being boastful/loud about my achievements brings me less opportunities than if I do. This is primarily because others around me are somehow always selling themselves more than I think even decent. This makes trying to be humble (and confident) very very difficult.